Join award winning Bruny Island Cruises for a great day out. 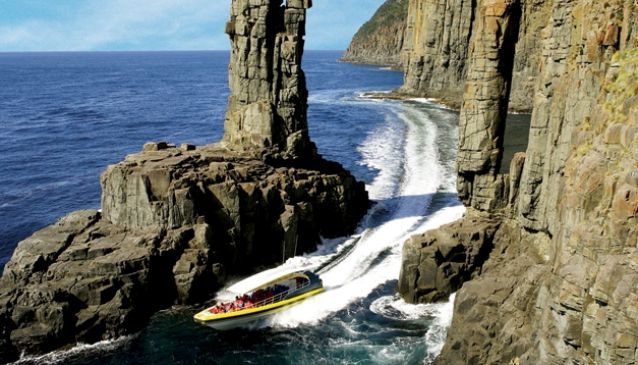 This cruise is the winner of Tasmania's Best Tourist Attraction in 2006, 2008, 2009, 2010, 2011 & 2012 which shows that this is an exceptional adventure. Take an all day trip from Hobart or a 3 hour cruise from Adventure Bay on the island. Enjoy sea cliffs and rugged coastlines and plenty of marine life. Seals, dolphins, whales, gannets, sea eagles and albatross are all often sighted as well as other surprises. After years of experience operating cruises, custom designed boats are now used that are best suited to their eco-cruises, with superb manoeuvrability allowing close viewing of the spectacular coastline and sea and birdlife. The well trained guides love their work - if you can call it that! Cruises operate daily departing 11am and returning 2pm. Tours run all year round, except Christmas Day. Pennicott Wilderness Journeys also run Tasman Island Cruises.